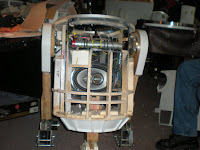 With as many droids as I am building it would cost a fortune to put motor controllers in each and every one. So I am making one that is transferable between a few of my droids as it is unlikely I will be driving more than two at a time LOL. The only droid that will have his own permanent controllers is Patches (R2-CM) as he has way to much other wiring overlapping these systems. First I helped Steve lay out the rest of his frame cuts and we routered them. Once the routing was done we dry fitted the frame. Everything looks good so next time we will glue it up. 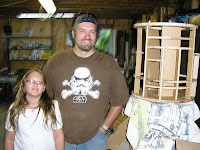 Brad brought over his sander and Syrena and Jeff sanded all the center leg pieces smooth. 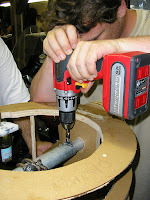 Then everyone clamped some more of their leg parts together and nailed them. Next we made a template for the outer leg hubs from one of Jen's R3 ones and made a few sets. During all this building I managed to make a few T3 parts as well. I got the rest of the wire cleaned up tonight. I took about another foot out then put new new connectors on the wires and soldered everything back up. Next I gutted ED's brains so I can put them on a sheet of plastic that I can transfer from droid to droid as needed. I will work more on this tomorrow night. Brad was not happy how his hybrid skins were fitting his R2 so I gave him a hand to see what was wrong. We took the skins off completely and cleaned all the extra hot glue off of them and the frame. We then sanded the back sides of the skins where there was many burs. After some measuring I found a spot on his frame that was bulging out so after much reshaping of the frame they started fitting. Both sides are lining up now and flat to the frame. We then pulled off the legs to get in to all the tight places and screwed the rest of the inner skin on. Now all Brad has to do is clean up the skin and countersink all the screws so we can put the outer ones on. As I add more and more gadgets I have less and less room inside of R2-CM. 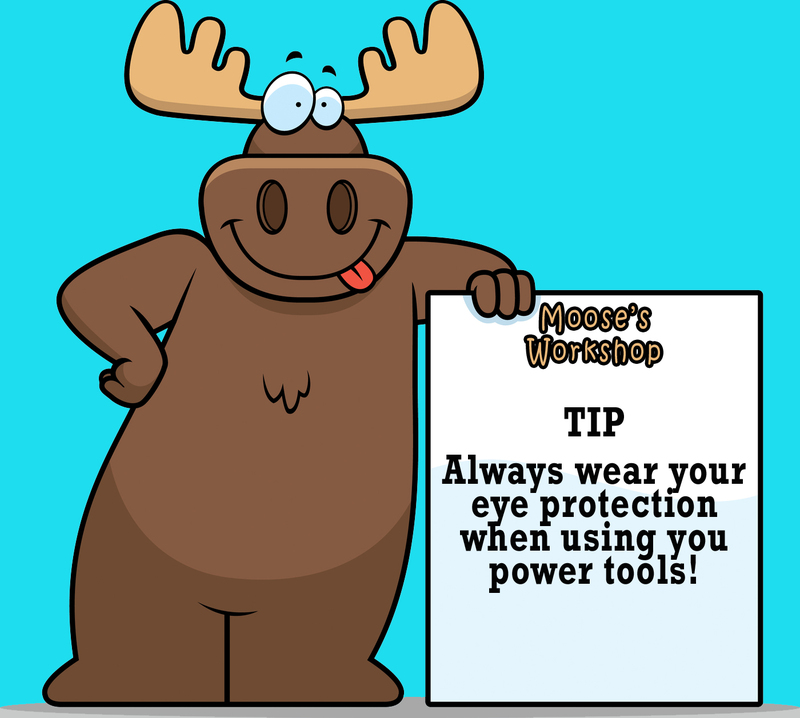 Also I have lost power twice now when going over rough surfaces so I had to trace down some loose wires anyway. The new rewire will get rid of most of the extra cross over wiring from side to side so it is easy to track wires. Also the power board and toggle switches are being moved because I decided to glue the long back doors on permanently. Later i will also rewire my sound system so there is more room as well. Here is the new pile of wire I took out of the droid. The wires are getting neater but still plenty of slack so the can be moved if necessary. I will post a picture of Patches' insides again later when it is finished. 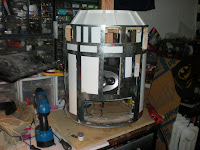 Here is T3 in static mode, still have some work to do to have the shell completed. 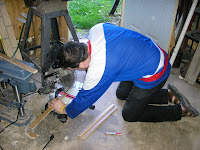 Steve works on routering some pieces for his frame. Nate works on cutting a few pieces as well. Steve and I glue all the Leg holders together for everyone. We got some more work done tonight. I cut the last pieces of wood for three of the center legs. 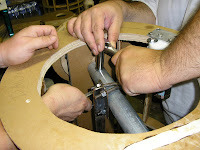 Then the owners of the of the legs glued the first two pieces together. Then they were clamped together and set aside to dry. After giving some pointers the Steve and Nate got to work finishing some routering on their frames. Next week they should have their frames dry fitted ready to glue up. Syrena showed up first and she brought her dome to show how the sanding is going. Looking good! We needed to make some shoulder hubs for her and Steve's R2 legs so we made a new template with the widow maker tool. Once that was done the circle piece of wood was used to make outlines for the other three pieces and Syrena and Jeff cut rough cut them out. Steve got to work cutting the notches out for his frame with Dash on the jigs.... ...while Jeff notched out the smaller frame pieces on the band saw. New member Nate started on his frame as well tonight. He got all four cirlce pieces cut and routered smooth. LC did some finishing work on his skirt. The BARN was covered in so much saw dust that Jen spent most of the night just cleaning it off of everything. Thanks Hon! Also even with all the tables I have it still tends to get crowded on most tables. I got T3's rear axle built today. 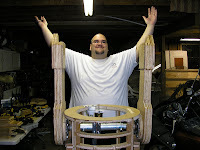 Very heavy duty!Once I got the rear one made I finished the front one as well. Here is T3 in the lay down position. Here he is in the sitting position. Not much to report this weekend. With a little help from Jen I got the axle assembly for T3's rear legs put together. 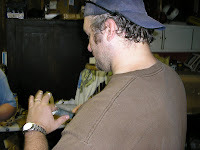 Last night Jeff came over to work on his droid, first he finished grinding off the mounting bolts on the underside. 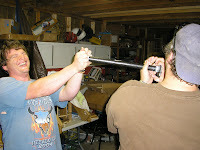 We then drilled the holes in the center support pipe. That is using my head! After bolting the legs tightly together, the legs now move as one! Here is R2-TD and Dawmer scoring a touchdown. Here is the video of the fireworks show at the ball game that had a Star Wars theme to it. Video taken by Dawmer. The R2-Builders and 501st had a great time together as usual. After the leg work Brad and I helped Jeff with his droid. After a bit of fine tuning we were able to get his dome movement set up working right. 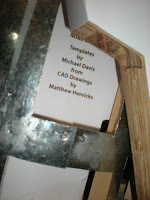 Next we put the T-nuts in the frame that holds the inner workings together. 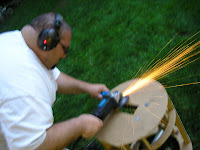 Then Jeff went to town grinding off the extra bits of bolt that stuck through the bottom.